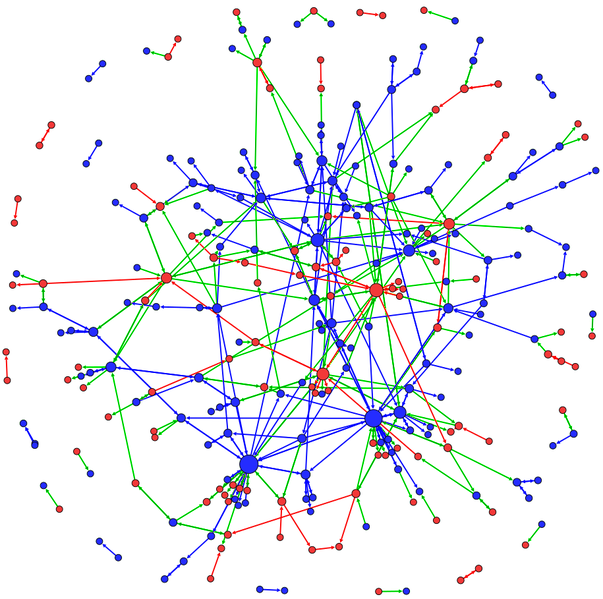 The Figure shows the network of replies in article discussions between Democrats (in blue) and Republicans (in red). The size of each node is proportional to the number of connections (degree). Edges connecting two Democrats are depicted in blue, edges connecting two Republicans in red, edges connecting a Democrat and a Republican in green. In contrast to the fragmentation observed in the blogosphere and in the twittersphere, the figure shows evidence of the remarkable presence of dialogue and debate between the two parties in Wikipedia. Some of these userboxes are quite popular; for example, the last one is present in the personal page of 177 users. This method may thus result in the association of a considerable number of users to a positioning about climate change, which would allow an analysis of the behaviour of different user groups and the interactions between them. This entry was posted by Barcelona Media on Tuesday, December 11th, 2012 at 10:19 pm. It is filed under climate change, Events. You can follow any responses to this entry through the RSS 2.0 feed. You can leave a response, or trackback from your own site. © 2012 EMAPS | Powered by WordPress | Theme 'Sirup' by 1000ff | 36 queries 0.238 sec.